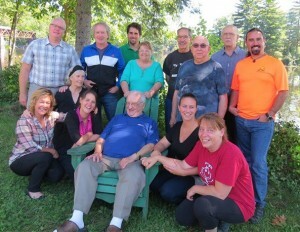 Brothers and Partners in the Francophone Canada District recently connected through an annual event that unites the community of four Brothers at Notre-Dame de la Rouge Center with the center’s staff and board members. The formal meeting, held in February, allowed Partners to express their views on their apostolate. It also provided time to read evaluations left by the groups and discuss the major renovations that are taking place, including the challenges. While the Brothers, due to their ages, are not directly involved in the programs, they stay informed of activities, greet the young people who participate, and pray for the success of the programs. Brothers and Partners pray together regularly, share meals, and have at least one annual retreat. “The symbiosis that exists between the Partners and the Brothers is really striking and plays a major role in the success of the apostolic activities held at the center,” said Brother Maurice Lapointe, FSC, chair of the center’s board.